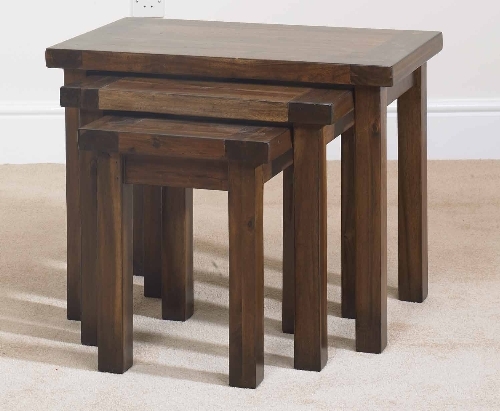 The Kember Nest of 3 Tables is part of a solid wood range made from Solid Acacia Wood with Veneers used to tops and sides of tables and storage/display units. Knots, deep grain variation and colour contrasts are features of this rustic wood range, formally known as the Cognac it has been modified to include Veneers to avoid splits and offer stability. A Beautiful, solid and dark range of furniture.